It is almost impossible to memorise the entire repertoire of cuneiform signs. Fortunately it is not actually necessary, as there are several standard sign lists available in book form (but none in English). 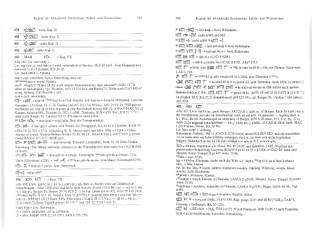 On this page we describe how to use the two most commonly used by Assyriologists: René Labat's Manuel d'epigraphie akkadienne (6th ed., 1995) and Rykle Borger's Mesopotamisches Zeichenlexikon (2004), as well as the online Pennsylvania Sign List. Other signs lists are listed on the Further reading page. number of vertical wedges 𒁹. Of course, because some signs changed their appearance quite dramatically over time, different sign lists take different forms as standard. Single-period lists naturally use just that period's sign forms. But multi-period lists like Labat's and Borger's take the Neo-Assyrian sign form as standard. This is partly for historical reasons, as Neo-Assyrian script was the first to be deciphered in the mid-19th century, and partly for pragmatic reasons, as Neo-Assyrian sign-forms do not vary very much. Information about the cuneiform sign KID is given at the top of this double-page spread from Labat's Manuel. From left to centre we see the sign's evolution from the fourth to the first millennium BC, in Assyrian (top) and Babylonian (bottom) scripts. In the middle are its standard Neo-Assyrian form, and common and rare syllabic values, with symbols showing when each is attested. Logographic values and their Akkadian equivalents are given on the right. View large image. As its name suggests, Labat's Manuel d'epigraphie akkadienne ("Manual of Akkadian Epigraphy") is designed for readers of Akkadian, rather than other languages written in cuneiform script. Its advantages over Borger's Zeichenlexikon are that it presents all of its information on a sign in a single place, and that it systematically shows the evolution of sign-forms from the late fourth millennium onwards. This is a particularly attractive feature for learners, as seeing the 'mature' forms of cuneiform signs together with their more pictographic precedessors helps to make them more meaningful. Equally useful are the little diagrams and symbols that show when and where particular values were used, and in which types of texts. On the other hand, Labat is not as exhaustive or as up-to-date as Borger. View the Concordance between Labat's signlist and the Unicode Cuneiform character set. 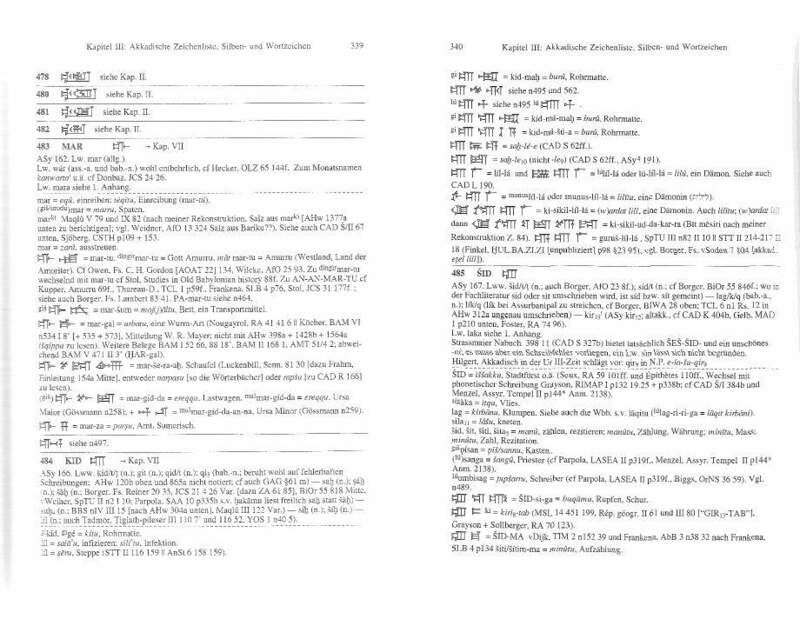 The entry on Akkadian readings of the sign KID runs across two pages of Borger's Zeichenlexikon. After a cross-reference to Chapter 7 (on sign development), there is a very dense section giving the syllablic values and where they are attested. Under the dotted line, and running on the the next page, is a list of logographic values of KID (including compound logograms), their Akkadian values, and English translations. View large image. 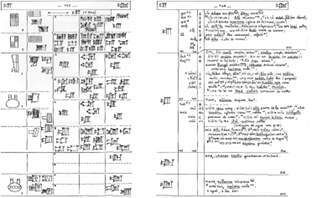 Borger's Mesopotamisches Zeichenlexikon ("Mesopotamian Sign Lexicon"), by contrast, aims for complete coverage of the cuneiform script, whatever the ancient language. However, it rather confusingly scatters (and duplicates) information about each sign across several chapters and treats sign-development rather skimpily. It is particularly good for readers of first-millennium scholarly texts that use rare sign-values in a standard paleography. Learners usually find it very difficult to manage but if you want to use it, Chapters 3–5 are most useful. View the Concordance between Borger's signlist and the Unicode Cuneiform character set. PSL, the only online sign list, occupies the right-hand side bar of the online Pennsylvania Sumerian Dictionary [http://psd.museum.upenn.edu/epsd/nepsd-frame.html] (PSD). As you might guess from its name, it is primarily designed for readers of Sumerian. However, it has some useful features for Akkadian-language users too. The bottom-right menu also allows you to view all homophones of the sign value you are interested in, and various types of compound sign containing your sign. These are particularly helpful for exploring Akkadian syllabic signs and logograms. On the other hand, because PSL does not (yet) contain any data on the validity of particular sign values—when and where and in which languages and genres they were used—it is a rather dangerous tool for beginners. For the moment, only Labat's Manuel gives this vital information, concisely and consistently. Most commonly we reach for sign lists to help us identify unknown signs in a text we are reading. Unfortunately this is rather hard to do, unless you are working with Neo-Assyrian script and the left-hand side of your unknown sign is fully preserved. In that case you can simply look up the sign in Labat's main table or Borger's chapter 3, following the standard sign-listing principles. What are the options otherwise? 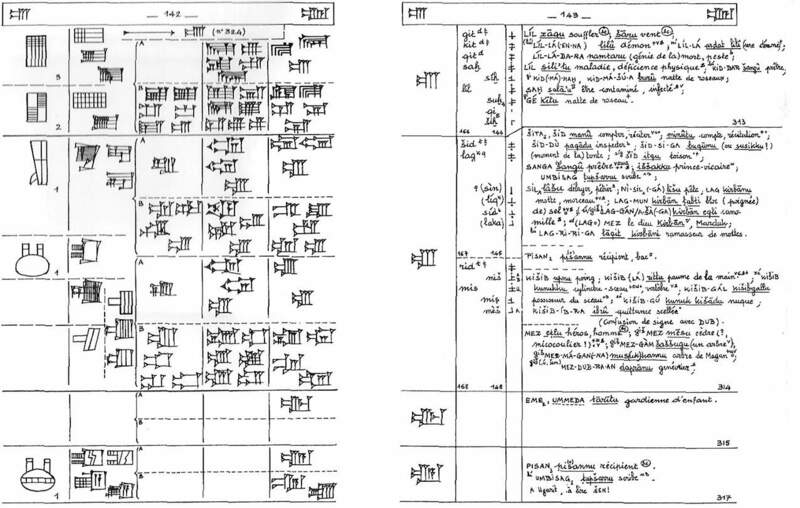 Labat also has an index of Neo-Babylonian signs near the front of the book, keyed to the entries in the main table. This often (but not invariably) quite useful for Old Babylonian signs too, as the two scripts are quite similar in some respects. You can make an educated guess at the value the sign ought to have, based on the signs immediately around it, and then look up that value in the relevant index of Borger or Labat. Then you can compare your sign with the entry in Labat's table or Borger's paleographic list. The PSL lists of homophones and compounds can often be useful aids in this type of search. Or you can simply page through Labat's table, looking for the closest match to your sign in the relevant script. I have done this countless times. It doesn't seem very clever or efficient, but sometimes it is the only way to find what you are looking for. The moral of the story is: the more signs you know, the less dependent you will be on sign lists, and the more efficient you will be at reading cuneiform. Make a point of learning new signs as you come across them, even when you are no longer a beginner. But sign lists are invaluable tools, even for the most experienced cuneiformist. And the more you use them, the more comfortable you will be with extracting useful information from them.